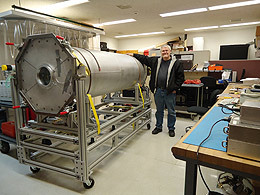 Michael Pierce, a UW physics and astronomy professor, poses with the infrared camera he built over the course of the past seven years. Pierce plans to use the instrument to study the history of the universe. Michael Pierce plans to study the history of the cosmos -- going back 10 billion years -- with an infrared camera it took him seven years to create. 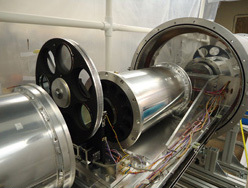 The University of Wyoming physics and astronomy associate professor has built the Near-Infrared Imaging Spectrograph (NIIS), which is the first infrared camera to be developed in Wyoming in almost 20 years, according to Pierce. The instrument is large -- measuring 7 feet long, two and a half feet wide and weighing approximately 1,000 pounds. The camera is fully cryogenic, meaning that all of its mechanical and optical parts are cooled to liquid nitrogen temperatures -- approximately 300 degrees below zero Fahrenheit -- in order for it to operate at infrared wavelengths. Infrared is a type of light that is beyond red on the electromagnetic spectrum. "I'll be using it to characterize the star-formation history of the universe," Pierce says. The speed of light is finite. When one looks at the sun, you actually see the sun as it appeared approximately 8 minutes ago, he says. "That's why astronomers sometimes measure distances in light years, the distance light travels in one year (approximately 6 trillion miles)," Pierce says. "For example, the nearest star is four light years away, meaning we are seeing it four years in the past. When we see light from enormous distances, we can actually see billions of years back in time." Because the universe is expanding, ever-distant objects are moving faster and faster. As a result, light from distant objects gets stretched to "redder and redder wavelengths," he says. In addition, the infrared camera will be used to observe gamma-ray bursts, one type of exploding star. By measuring the frequency of such bursts, it's possible to measure the rate at which stars form, he says, adding he has collaborators at NASA interested in using the camera to study gamma-ray bursts. Our galaxy, known as the Milky Way, is filled with gas and dust, which obscures light from distant stars. Infrared light can easily escape that gas and dust, and allow clearer views of such stars. Subsequently, those views provide more clues to the star formation within the galaxy, he says. At present, the NIIS is limited to imaging only. However, plans are underway to include a multi-object, spectroscopic capability. A spectrograph is designed to break down a star's spectrum, a collection of rainbow-like colors obtained from a star by breaking its light down into components. This will allow for more detailed research of the distant universe, Pierce says. In March, the infrared camera was shipped to Apache Point Observatory, located in Sunspot, N.M., and operated by New Mexico State University. The camera was used on a large 3.5-meter telescope for an extensive series of tests and it performed well, Pierce says. "I envision this infrared camera as a transformative instrument in the sense that it's on a much bigger scale than most other infrared instruments," Pierce says. "It has one of the widest fields of view -- approximately half the size of the moon -- currently available. This will enable us to survey larger areas on the sky much more efficiently than we otherwise could." The infrared camera is housed within a large silver cylinder that is pumped free of air. Much like a thermos bottle, the cylinder enables the lenses and mechanical components in the interior to be cooled to 300 degrees below zero. The interior vacuum prevents frost and ice from forming inside the camera. The interior assembly is supported using a fiberglass structure, which thermally isolates it from the warm exterior. Twenty-five layers of Mylar film provide further insulation to the camera components, allowing them to cool to 300 degrees below zero when liquid nitrogen is added to an interior tank inside the camera. The interior of the infrared camera includes a large black disc (center), which is the filter wheel. The wheel, which is positioned using a cryogenic motor and gear system, contains a set of filters that isolate specific infrared wavelength regions or "colors." Fifteen lenses, which re-image the light from the telescope, are encased inside. Because infrared light cannot penetrate glass, the lenses are made of exotic crystalline material, including calcium chloride, barium chloride and zinc selenide. These are extremely fragile, Pierce says. The extremely low temperature presented a challenge. Because metal shrinks at such cold temperatures, there was concern the lens mounts would shrink down onto the lenses and cause the lenses to fracture, Pierce says. A large wheel inside the camera allows different filters (each approximately 4 inches across) to transmit and isolate different wavelengths of light. Pierce compared the wheel's capability of rotating various filters to "changing records on a jukebox." His project began in 2005 with an $800,000 National Science Foundation (NSF) grant, which was approved by the Foundation's Major Research Instrumentation Program. The state of Wyoming and NASA's Goddard Space Flight Center also provided funding. While most of the mechanical work was done at UW with the help of graduate students, engineers and staff, the lenses were ground and tested by Optical Solutions Inc., a company based in New Hampshire, Pierce says. Beginning this summer, Pierce says the infrared camera will be housed at Apache Point rather than WIRO because the New Mexico-based facility has a more powerful telescope and offers the potential for more research capabilities. Partner universities include New Mexico State University, Princeton, University of Colorado, University of Virginia, University of Chicago and the University of Washington-Seattle. For more information, go to http://physics.uwyo.edu/~mpierce/IRCAM/index.html.